Alexander Deriev is the editor and publisher of the online and in-print journal of poetry, translation and art Ars Interpres, originating in Stockholm, music producer, and a renowned icon painter. The icons painted by him can be found in many churches in the Holy Land, USA and Europe, as well as in private collections. A new book of John Kinsella's poems entitled Icononotes (accompanied by Alexander Deriev’s icons) will be released later this year both in English and Swedish. Alexander Deriev was born in Kazakhstan, the former USSR. Influenced by Pavel Zaltsman, then the only remaining living follower of Pavel Filonov, he began to study painting in 1980. After studying the art of icon painting (or icon writing as the correct term is) with some influential icon masters in Russia, Alexander Deriev began painting icons in the mid-1980s. 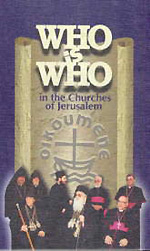 In the 1990s, Alexander Deriev published several books including Who Is Who in the Churches of Jerusalem and How to Write Icons. 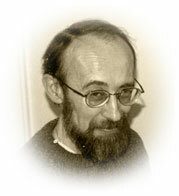 In 1994, he also co-edited an English-Russian newsletter Joy of Resurrection (1994). That same year Alexander Deriev recorded his first CD entitled Russian Sacred Masterpieces, which features music performed by the Choir of St. Thaddeus. So far, Alexander Deriev has compiled and produced over 50 CDs for both several Israeli companies and The Divine Art Record Company in the UK. All these CDs emphasize rich musical traditions of various Christian denominations. Since 1999, Alexander Deriev lives in Sweden, where he teaches icon painting in different institutions across Scandinavia, produces recordings of liturgical music, and publishes Ars Interpres – a literary journal founded in 2003. In addition to being the founding editor of Ars Interpres, Alexander Deriev is also a member of the editorial advisory board of a couple of international literary reviews. In 2006, an interview with Alexander Deriev by Marcus Grodi was featured on The Journey Home EWTN TV show. If you are a group of 15 - 18 people, Alexander and his staff are prepared to come from Stockholm, Sweden, to your own hometown parish. Just send an e-mail with preferred dates and location and we will work out a plan together. With this letter I would like to recommend Mr Alexander Deriev and the courses in icon-painting that he is offering. Mr Deriev has a long experience of this art and he has also profound knowledge about the theology and spirituality of the icons. Through his courses he can contribute to better understanding of and dialogue with the tradition of the Eastern church. I do hope that Mr Deriev will be able to help many interested persons to paint icons and simultaneously learn about the spiritual heritage of Eastern Christianity – because he is also very eager to help his pupils to learn about this theological background of the icons. It is very important to stress this ecumenical aspect of his work. Through his roots in Russia and his deep knowledge of Russian tradition he has a lot to teach us in the Western world. contribute to increase knowledge of the spiritual riches which icons reflect." 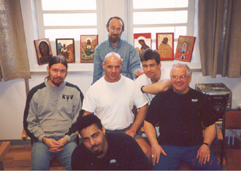 in the Sweden's maximum security Kumla Prison.